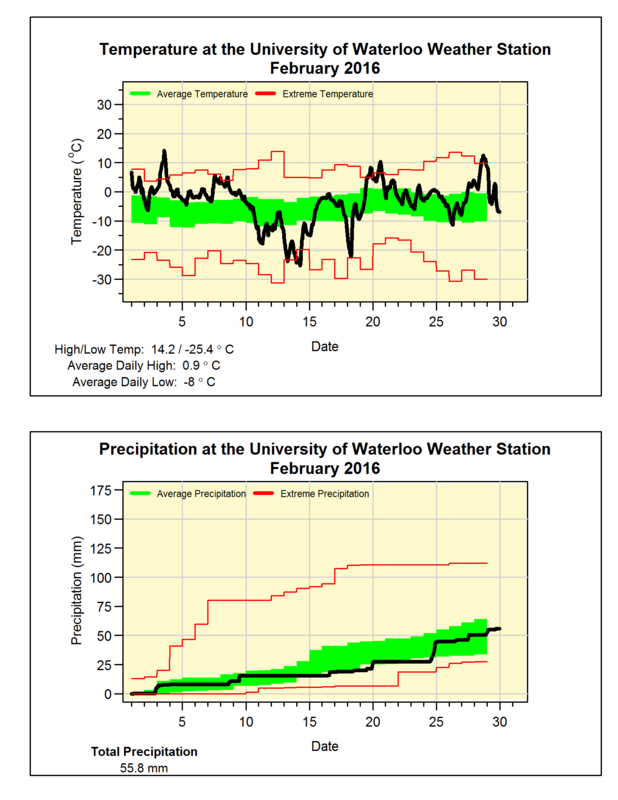 This blog highlights observations about the current (and past) weather conditions at the University of Waterloo weather station. Winter 15/16 Summary #2: The precipitation of 178.2 mm was just a little under the 1981-2010 average of 184.5 mm. Winter 15/16 Summary #3: So far we have seen about half of the average amount of snowfall, however that could change this week. Winter 15/16 Fun Fact 1: Longest streak of days without an above zero temperature: This winter 9 Days, last winter 41 Days. It was a month that saw some very warm and also some very cold temperatures. However, the warms ones greatly outnumbered the cold ones resulting in a month that was almost 2 degrees above the long term average. This is a lot, but we only have to go back to 2012 to find a warmer one. Of note is that the high of 14.2°C on the 3rd was the highest February temperature we have ever seen in the over 100 years of records in the region. This beat the 13.9°C on February 12th, 1999. Not many large storms during the month, with the final total precipitation of 55.8 mm ending up pretty close to the average of 54.9 mm. While the 17.5 cm of snow in February was just a little over half of the average of 30.3 cm. Just a reminder that there is only one more day to enter the UW Weather Station Contest. The entry period ends Monday, March 7 at 2:00 pm.